This book was a no brainer for me to sign up as a reviewer. From the brief description of it on TLC Book Tour website, I knew it would be right up my alley. It takes place mostly on the campus of a prestigious university and even more so at the Godwins Honor Hall. Perry and Nicole are both from the same small town of Bad Axe and they both came to this university as two of the brightest students. Both extremely different yet connected by that link, they develop a friendship during their freshman year as study buddies. Craig is Perry's roommate and far from the ideal student. He gets in on a favor of his fathers who happens to know the Dean. Smart, yet unmotivated, Craig sails through his days mostly smoking pot with another slacker named Lucas. The friends lives are forever changed when Craig begins dating Nicole and not long into their relationship, an accident occurs. Nicole dies and everyone blames Craig. But the details do not match up and that is where the rest of the cast of characters enter the picture. Shelly, an older woman who works at the campus Chamber Music Society, was the first witness to the accident. Though she gives her exact telling of the accident, the paper nor the college take the correct information down. After several attempts to correct their mistakes, Shelly begins to see that something is trying to be covered up. Mira is a professor of Death Studies on campus and gets approached by Perry to learn more about the what happens to us when we die. Turns out he keeps seeing Nicole around campus and Perry is convinced she is not dead. And then there is Josie (by far, the character I hated the most), Nicole's roommate and sorority sister at Omega Theta Tau. Flighty, self absorbed and totally manipulative, she uses her position as a work study student with Shelly to further cover up the "death" of Nicole. It's impossible to sum up this book. So much happens and it weaves back and forth in time every few pages. There has been some comparison to The Secret History by Donna Tartt and though I read that book over a decade ago, I would agree to an extent. They are both very complicated, involved thrillers surrounding a bunch of students at a upper crust college. But really I think that's where the similarity ends. This novel was almost 100 pages too long. I really enjoyed it and kept going back to it excitedly at every chance I could but the going back and forth in time made it a bit lengthy. I appreciate the fact that the author wanted to really give depth to many of the characters but some of the story didn't need to be told for the sake of the greater story. I was chopping at the bit to figure out what really happened. I knew all along that Nicole was not all she was supposed to be. She is described as being such a virginal beauty, great at school and a kind soul and perfect all around. Bleh! I knew something was up. At the same time, I knew that Craig wasn't the screw up he was portrayed to be either. As he grew more in love with Nicole, his softer and fragile side came out. The ending was a bit abrupt for me. I won't give any spoilers but it was summed up as a flashback almost. The last part was written so many years later. It did get summed up but I had to adjust to the changes in the characters that I had been reading so closely about and get used to them as older adults. Overall, I felt is was a very well written literary thriller. It was not a light read. It was almost too heavy at times with the sadness of Craig, the secrets of Nicole, the bitchiness of Josie, and the doom and gloom of the other characters, especially Mira. Mira, though very educated on her subject as a professor, lives a very dysfunctional life with her husband Clark and her two toddler sons. You get to go along with that at the same time she is helping Perry in his research about the dead. With that, I still recommend this to serious fiction fans along with those who like a layered mystery. It is a bit hefty in size, roughly 460 pages. Because of the detail to the story, it wasn't a skimmer. You had to pay attention to the flow of time and how the story meanders. For my club, I think it would be a bit dark but that doesn't mean that it wouldn't be a good pick for others. Being that it takes place on a campus, discussion topics can include academia, hazing, pressure, etc. With Mira's studies of the dead, there is quite a bit of history of ghosts and sightings and superstitions. If you are prepared for some heavier conversation, then it would be a good pick for you. Friday, March 25th: Book Club Classics! Laura Kasischke teaches in the University of Michigan MFA program and the Residential College. She has published seven collections of poetry and seven novels including In A Perfect World. She lives with her family in Chelsea, Michigan. I have an e-galley and planned on reading and reviewing this for today, but then when I went to read it I saw it was almost 500 pages and decided to read something else, LOL! I was afraid like you said that it might seem too long or not be a fast read. The other elements sound good though. I may try to get to it still. Excellent review darling :) I hadn't heard of this one before. 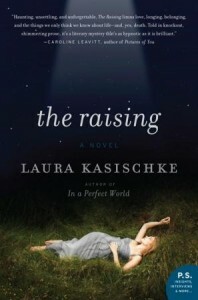 I have it on Netgalley and after your review, I think I will be reading The Raising soon. Thanks for a great review! Serious/dark/heavy reads are great when you are in the right mood. ooo, I have this one on NetGalley and am anxious to get to it now after reading your review! It almost sounds a little like a Carol Goodman mystery, did you find that at all? I think you were the one who turned me onto her if I remember correctly. I have this one to be reviewed next month and since I haven't started on it yet, I just sort of skimmed your review. I was able to tell you liked it with a few minor issues but I didn't want to know more than that. Hopefully I can get started on this one soon. Interesting! I think I have a good feel for the book but you didn't seem to give much away! Despite its flaws, sounds like a book I'd love. Your comment about the ending reminds me of what JK Rowling did with the end of the Harry Potter books - it answered all the questions, but it wasn't exactly how I would have liked it to go. Still, this book sounds like an exciting read! It sounds like this might be a good book for fans of several different genres. Thanks for being on the tour. You were nicer than me! And I agree that it was too long. Also, I almost liked the parts with Mira and Shelley better and could have almost skipped all the stuff with Nicole...but that is the point of the book. I'm glad the book worked better for you but I thought it ended up being a mess.